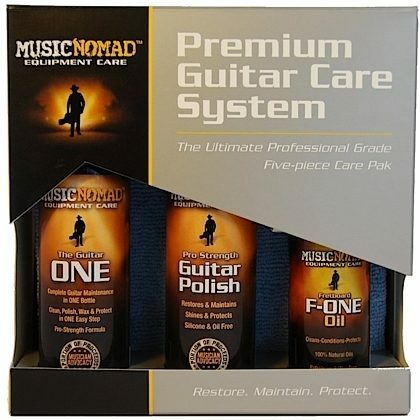 This 5-piece Music Nomad Premium Guitar Care System is the ultimate professional grade care kit that contains one each of their most popular items for premium care and maintenance. Great for all types of stringed instruments such as electric guitar, acoustic guitar, ukulele, mandolins and guitar care for all makes such as Fender, Gibson, Martin and Taylor guitars. 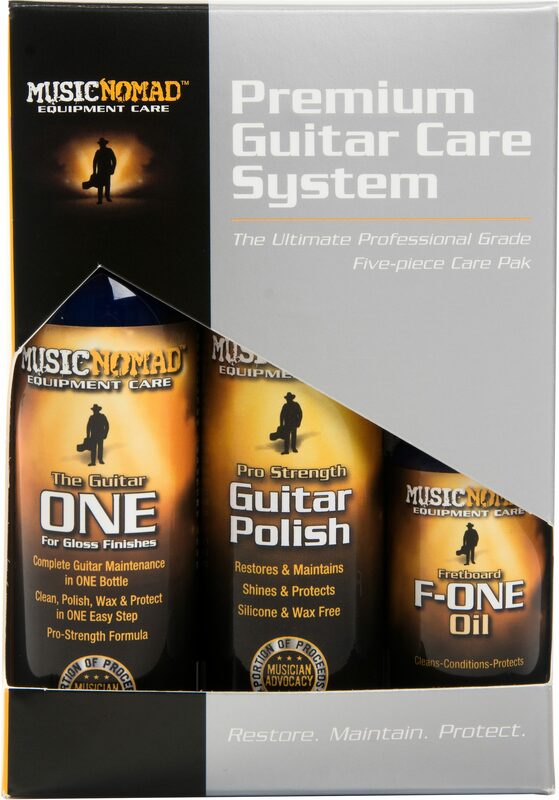 With this guitar care system by Music Nomad you get premium quality formulas, tech & repair shop approved products and they smell great! Combining their passion for cleaning and helping independent musicians, Music Nomad Equipment Care Products deliver professional grade products to clean & protect. They bring together talent from around the world to help in making the best products for musicians. It's like a face lift in a bottle. Our silicone and wax free cream polish restores and revives dull, hazy, scratched and scuffed finishes. Our proprietary formulation removes oxidation from hardware (pickups and frets) as well. Nitro and poly lacquer safe. Eco friendly bottle. Specifically designed to work with our fretboard F-ONE oil. Containing 90,000 microfibers per square inch our lint free, hem free cloth is perfect for cleaning, conditioning and protecting your fretboard. Put a small amount of F-ONE on this cloth and make your fretboard look great again. Specifically designed to work with Guitar ONE and Guitar Polish. Our super soft, microfiber towel safely cleans and polishes all surfaces. Non-linting, machine washable and innovative stitch free edging design.